In spite of it all sin continues, and sin abounds; and all because it is its nature to deceive us. "Sin taking occasion by the commandment, deceived me." How did it do so? How does it still do so? 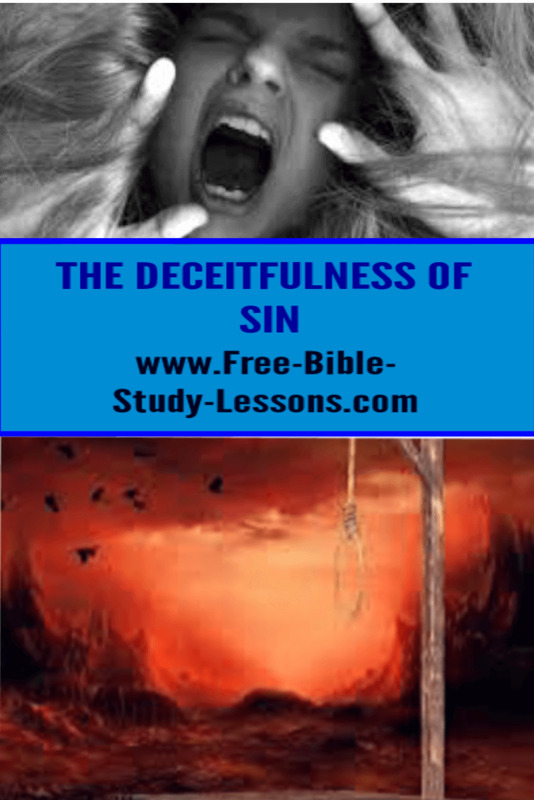 How does sin use the Law of God to deceive us? How is it that "the strength of sin is the law?" I would classify the answers in the following way. First, sin deceives us into misusing the Law. I take my statement from Paul in his First Epistle to Timothy [1:8]: "The law is good, if a man use it lawfully." Ah yes, but sin comes in and makes us use it unlawfully. ...one way in which it does so is that it persuades us that nothing matters but actions, and that desires, imaginations and so on do not count at all. It persuades us to believe that if we have not performed an actual evil deed we remain free from sin. Nothing matters except a man's actions. As long as I am not committing those actions I am keeping the Law, and I am therefore justifying myself in the sight of God. "Sin deceived me," says Paul, and it did so in that way. Paul was quite convinced, as we have seen in the Epistle to the Philippians, and in other Epistles, that he was really keeping the Law, and that "touching the righteousness of the law, he was blameless." He thought he was doing really well, he was "alive without the law once." Sin had deceived him by taking the commandment and saying, "Ah yes, the commandment means that as long as you do certain things and refrain from others you will be right with God." And he believed the deceit and acted accordingly. Not a word about coveting, of course! And so sin deceived him into misusing the Law. But sin also works in another way. When we fall into sin, and our consciences begin to speak strongly and to remind us of the Law and its dictates, then sin changes its tactics completely. It now comes to us and says, "Yes, that is right; you have sinned, you have failed; remember that the 'law of God is holy and just and good' and you have now broken it. You are in a completely hopeless position." Then the next step is that we say to ourselves, "Because I have failed and am hopeless there is no point in trying any further. Having sinned once I might as well sin again. I will be be no worse, for I am already hopeless." So we sin the second, and the third, and the tenth, and the thousandth time. That is how sin comes to us. Having depressed us, it persuades us that what we do no longer matters. That is a further misuse of the Law. Another method used by sin - and this is one of the most terrible of all - is "antinomianism." ...It works this way. We have sinned and we are conscious of having broken the Law. Then sin, coming as "an angel of light," says "You have sinned and have broken the law, but don't be troubled. Realize that 'where sin abounded, grace hath much more abounded.' You have nothing to worry about at all. The more you are conscious of your sin, the more grace increases, and in a sense, the more you sin the more grace operates in your case. You are a saved man, you are 'under grace,' so what you do no longer matters." Antinomianism is one of the most blinding curses that has ever afflicted the life of the Church. It troubled the early Church, and it has continued to do so every since. Men, taking the letter of the doctrine of justification, and the 'letter of the law' twist them to say that our actions no longer matter because we are now under grace; we can continue in sin because we are no longer 'under the law' but 'under grace.' Thus the deceitfulness of sin makes us misuse and mishandle the Law. Sin also deceives us by creating within us an antagonism to the Law; it makes us feel that God is against us. That is what the devil did to Eve. "Hath God said? Yes, He is against you." The moment the Law begins to speak, sin always comes in at that point and says, "Yes, that is exactly what it does say, and that is because God is what He is - He is against you, a stern, feelingless Lawgiver." But sin does not stop at that. It also makes us feel that the Law is unreasonable in its demands upon us, and it is unjust. It makes us feel that the sentiment expressed in the line of a well-known hymn is true. "Always fast and vigil? Always watch and pray?" The Law is made to appear narrow and cramped, prohibiting everything you like, and urging upon us things we do not like. The Law of God, says sin, is unjust, is impossible, is unfair; it asks of us something that no man can ever do. So sin persuades us to hate it; and because of our bitterness and hatred against it, when it tells us not to do something it creates within us the desire to do it. Another manifestation of the subtlety of sin is the way in which it deceives us about ourselves. In a very subtle way sin comes to us and fawns upon us and praises us; it makes us think very highly of ourselves. It asks why we should be held down under the Law? As the devil put it to Eve, "Has God said you are not to eat of that fruit?" In other words, "What did He set that limit? Why should you be deprived of what is desirable? Why should there be a limit to what you may do? It is an insult to your human nature. You were meant for freedom; God is against you. Assert yourself, live your own life; you are able to look after yourself and to govern your own life." The devil still does that, and persuades us of our right to freedom and self-determination. He convinces man that he is autonomous, able to govern himself and his world, and does not need anything outside himself. O the subtle deceitfulness of it all! Another expression of this subtlety is particularly common at the present time. The Law comes to us and prohibits certain things. "Yes," says the devil, "and that is where, again, it is obviously against you; because it is telling you not to use the powers and faculties that you have within you. You have certain instincts, you have certain impulses and drives within you. Obviously they are there for some good purpose, they are good in and of themselves. So why do you not use them? " That is the popular teaching today. We are told that we should never have a feeling of guilt; that that is Victorianism and Biblicism, the Old Testament. We must never talk about sin, and never have a feeling of guilt because that violates our personality. One of the most popular manifestations of the modern mind is the cult of "self-expression" which says, Let your instincts govern you, do what you feel like doing; give full expression to your innate powers. They are never to be repressed. That leads to unhealthiness and unhappiness. Many psychiatrists in treating their patients actually encourage them to do things that are prohibited in the BIble. They tell them that their trouble is due to the fact they have repressed their personality as the result of accepting the biblical doctrine of sin. Sin in its subtlety thus deceives people by praising them, and by getting them to express themselves and their innate evil powers. Finally, sin deceives us about itself. It does so by making sin very attractive. We read that Eve "saw that the tree was good for food, and that it was pleasant to the eyes" and she believed that it would make her wise if she took from it [Gen. 3:6]. How extraordinary it was that God should prohibit the eating of such pleasant, perfectly formed fruit, with its beautiful colour and all else. No doubt the taste would be equally wonderful. The finest fruit in the Garden; yet God prohibits it! "Sin deceived me," says Paul, and it still deceives by making sin very attractive. The Christian life is made to look very drab; and how wonderful the world looks. Look at the lights of London and of Paris and New York. Look at the smiling, laughing throngs, the beautiful dresses, the bright eyes. Of course, you must not ask how all this is produced and to what it leads. You must not talk about the drugs or the alcohol such people have been taking, and all the heart-break after they go home or the next day. No, no! But look at it; does it not seem wonderful? A man comes up from the country, and seeing life in London he says, "Why, I haven't been living, this is life, this is marvellous. How attractive, how beautiful, how pleasant to look upon, how good it must be!" He reads thrilling reports of it in the newspapers and hears people praising it and talking about it and recommending it. All are saying, "This is the real life; this is what the great and the famous and the illustrious people really do. How wonderful!" It all appears so attractive, so seductive, so interesting, so big, so noble, so free, by contrast with the Godly, biblical, Christian life. It deceives us further by discouraging any thoughts about consequences; it ridicules them. Do you remember what the devil said to Eve? "Did God say that if you eat of this fruit you will certainly die?" Then he said, "You shall not surely die." Note the dogmatism. Yet they did die. But the devil with the utmost dogmatism and assurance and said, "You will not surely die." And Peter reminds us in his Second Epistle that the godless are always saying the same thing. "Where is the promise of His coming?" [2 Peter 3:1-11]. Sin deceives us about the results and ends; it assures us that nothing unpleasant is going to happen. It hates all punishment, it hates the very idea of retribution. The popular and prevailing teaching today says that you must never punish, that the purpose of prisons is solely to reform and rehabilitate. That is what leads to the presents chaos in prison life, indeed in the whole of life. This is part of the seduction of sin, the deceivableness of sin which discourages any idea of justice and righteousness and of punishment; and, of course, supremely, and idea about hell. Hell is just unthinkable to the modern mind. No intelligent person every talks about hell, we are told; no decent person talks about hell. It is ridiculed and dismissed as being totally incompatible with a God of love. That is how sin speaks. Sin, as an angel of light, talks much about the love of God. It will talk about anything in order to get you to close your eyes to the consequences of your actions, and the end to which they lead, and especially to the death, the eternal death, in which they are going to issue. To see the deceivableness and the deceitfulness of sin at its very zenith, listen to what it says about the Cross of Christ on Calvary's hill. Alas! how often is false doctrine heard in so-called Christian pulpits! Preachers say, "What is the meaning of the death, that Cross? It is nothing but a great exhibition, a tableau, of the love of God. Do not talk about substitutionary atonement. Do not talk about the righteousness and the justice of God. Do not say that God was there punishing His Son in order that we might be freely forgiven. Do not talk about the wrath of God, do not talk about propitiation. It is all love; there is no punishment. God is a God of love; so live as you like; all will go to heaven in the end." That is how sin talks in its deceivableness and deceitfulness. Universalism! All are going to be saved; there is no division of mankind into the "saved" and the "lost." Even out of the Cross of Christ - the most glorious event the world has ever seen, where God was revealing His eternal justice and righteousness by punishing His own Son, and not sparing Him anything - even out of that they take the glory in order to deceive us about the whole function of the Law, and the very character of God Himself. That is how sin deceives us by giving us one side of the picture only. Sin does this work, as Paul says in Ephesians 4:17, by "darkening our understanding." It prevents our thinking clearly, it misrepresents everything; it gives us rose-tinted spectacles; it perverts everything, changes everything, transforms everything. Even the devil, as Paul says, can transform himself into a veritable "angel of light" [2 Cor. 11:14]. So sin deceived Paul, made use of the Law to deceive him, made him to see he was utterly helpless and hopeless and doomed and damned. Sin always does that. As James says in the 1st chapter of his Epistle in verse 15, "Then when lust hath conceived, it bringeth forth sin; and sin, when it is finished, bringeth forth death."